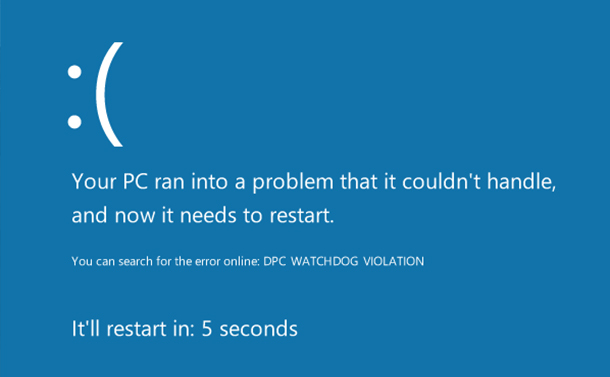 Blue Screen of Death (DPC_WATCHDOG_VIOLATION) bug check has a value of 0x00000133. DPC that means Deferred Procedure Call and Watchdog denotes a bug checker which regularly tracks your programs and PC performance. As per Microsoft, the error indicates that a DPC watchdog bug test was executed on your PC either due to a single long-running deferred procedure call (DPC), or because the system spent a prolonged time at an interrupt request level (IRQL) of DISPATCH_LEVEL or above. It means, when DPC test was executed on your PC, it was not getting a response from one of its hardware element, which caused the problem. Most of the hardware issue comes due to the incompatibility of device drivers and other issues. In case you are getting DPC Watchdog Violation Error, you can try the solutions provided below. If you are getting BSOD, Windows 10 will restart numerous times and you will not be able to access your PC. If automatic repair of Windows 10 couldn’t repair your PC, you will get the following screen. On this screen, you need to select Advanced options. Now, click on Troubleshoot option. On next screen, click on System Image Recovery. If you have an .iso image of Window 10 on your PC, you need to select System Image Recovery and follow on-screen instructions to recover Windows 10. Alternatively, if you previously created a restore point, click on the System Restore button and you will be presented with the main screen for System Restore. Otherwise, you can also try other options to troubleshoot the problem, or you can go to Troubleshoot Window to Reset the PC. Once you have chosen, Reset this PC, you will get two options Keep my Files and Remove everything. Tap on Keep my Files and follow on screen instructions to Reset the PC. If you have got the DPC Watchdog Violation Error just after installation of software updates of Windows 10, then this might be the cause of the problem. To resolve the problem, you need to uninstall the recent software updates. If you can reach to your desktop, then type Control Panel in the Cortana search bar. Now go to the Programs and Features >View Installed Updates > Right-click on the Update and click on Uninstall. You can follow the steps below to update the chipset driver of your Windows 10 PC. Type Device Manager in the Cortana search bar located near the Windows 10 Start button. Now, extend the option IDE ATA/ATAPI Controllers, right-click on the SATA AHCI Controller driver and click on Update driver. In the next window, click on Search Automatically for Updated driver Software. Follow on-screen instructions to update the driver. Note: If you have installed a SSD drive on your PC, then this solution will not apply. If you can manage to start your PC, you can try Windows 10 in-built troubleshooter to resolve the problem. Type Troubleshoot in the Cortana search bar located near the Windows 10 Start button. Under the Find and fix other problems, click on Blue Screen and Run the troubleshooter. Now, Windows will try to detect and fix the problems, if it finds. Now scroll down to Program Compatibility Troubleshooter on the same screen and click on that. Here, you can see the list of the program installed on your computer. Click on the program, if it is the cause of the problem. Now, right click on Command Prompt and select Run as administrator. Give administrator permission and when prompted enter the command chkdsk c: /f /r. Press Enter. Now, type Y from your keyboard. Reboot your PC, so Windows will conduct a disk check. That’s all! We hope the above-mentioned solutions will help you fix the DPC_WATCHDOG_VIOLATION error on Windows 10. If you have any comment or suggestion, do share with us in the comments section provided below. Are You Facing Problem In Backing Up iPhone Data To iCloud? Blockchain On Its Way To Reform The Legal Service Industry?